TORONTO, ONTARIO--(Marketwired - June 22, 2015) - Galantas Gold Corporation (TSX VENTURE:GAL)(AIM:GAL) (the 'Company' or "Galantas") is pleased to announce encouraging results on its new licence areas in the Republic of Ireland (ROI). This ROI licence block lies approximately 33kms from the Galantas Omagh Gold-Mine, which has just received planning permission to extend underground. The latest fieldwork targeted areas within ROI licence numbers 4034, 3135 and 3234. 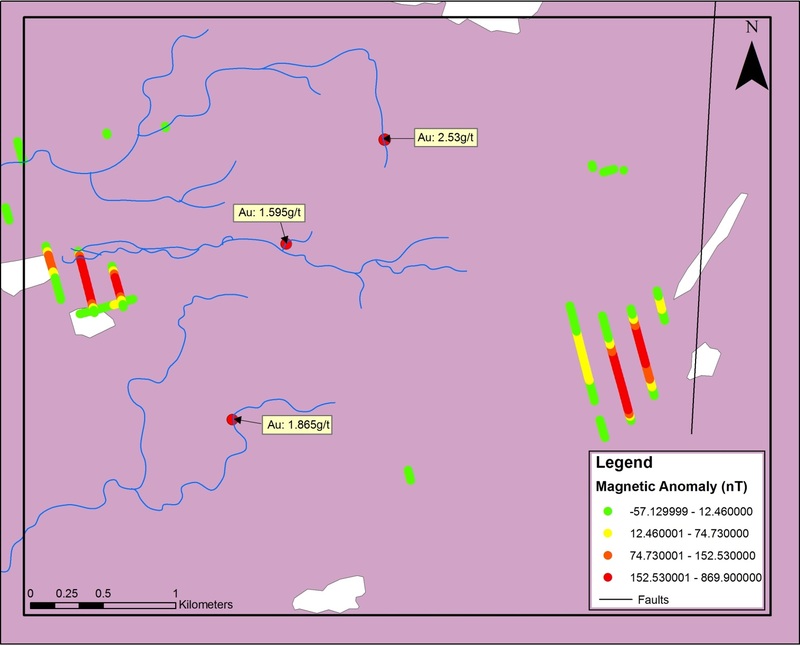 The targets were selected with consideration of the structural geology in conjunction with a review of the EU funded Tellus Border geochemical and geophysical datasets. Thirty samples were collected in total, thirteen of which yielded notable results. Most interesting were sediments collected from first order and second order streams which drained an upland area situated close to a distinct magnetic anomaly. These showed gold grades of 1.6, 1.9 and 2.5 parts per million (ppm) (g/t). Other samples showed anomalous results for Copper (191.5 ppm), Nickel (158.5 ppm), Zinc (175 & 257 ppm) and Lead (480 ppm). Follow up work is being planned. The samples were taken by geological staff under the supervision of R. Phelps C.Eng MIMMM, (President & CEO, Galantas Gold Corporation), the Qualified Person (QP) for the program under NI 43-101 and who is also a "Qualified Person" as defined in the Note for Mining Oil & Gas Companies, June 2009, of the London Stock Exchange. Sampling methodology, security and verification followed standard procedures (April 2006) with standards, blanks and duplicates added at a frequency of 1 for every 20. The samples were analysed (gold by fire assay and ICP-AES on 50g samples; other metals by ICP-MS and ICP-AES) at ALS Geochemistry Laboratories of Galway, Ireland, and were considered compliant with all requirements of International Standards ISO 17025:2005. All the samples were grab samples, in one case removed from outcrop (bedrock) and the remainder as un-panned stream sediments as indicative prospecting information prior to a more detailed program of evaluation. An illustrative map will be posted on website www.galantas.com . This disclosure has been reviewed by Roland Phelps C.Eng MIMMM (President & CEO, Galantas Gold Corporation) who as QP, has prepared,and approved the scientific and technical content in the news release. Galantas Gold Corporation Issued and Outstanding Shares total 87,297,155. To view the map, please visit the following link: http://media3.marketwire.com/docs/gal.jpg.